Urban gas accounts for 22 percent of the total natural gas market, with many types and large volumes of valves. Ball valves, plug valves, pressure relief valves, and relief valves are often required. A large number of metal-sealing butterfly valves, horizontal balancing valves and directly buried ball valves are needed in the urban heat supply system, this is because these valves can solve the pipe vertical and horizontal hydraulic imbalance, so as to achieve energy saving and heat balance. Low-pressure valves are generally used in urban construction system, which is developing towards environmental protection and energy saving. Environment-friendly glue plate valve, balance valve, middle line butterfly valve, and metal seal butterfly valve are gradually replacing low-pressure iron gate valve. In the environmental protection system, the middle line butterfly valve, the soft seal gate valve, the ball valve, the exhaust valve (used to expel in the pipeline air) are mainly needed in the water supply system, while the soft seal gate valve and butterfly valve are mainly used in the sewage treatment system. The long-distance pipeline is mainly crude oil, finished product and natural pipeline. The valves used in most of these pipelines are forged steel three-piece full-size ball valves, sulfur resistant plate gate valves, safety valves, and check valves. Most valves used in oil refining facility are pipeline valves, mainly gate valves, globe valves, check valves, safety valves, ball valves, butterfly valves, and steam traps. Among them, the gate valve demand accounts for about 80% of the total number of valves (valves account for 3% ~ 5% of the total investment of the device). Chemical fiber products are mainly polyester, acrylic, polyvinylidene three categories, the main valve are the ball valve, jacket valve (jacket ball valve, jacket gate valve, jacket globe valve). This device generally needs the valve produced by API standard, mainly including gate valve, globe valve, check valve, ball valve, trap valve, needle valve, and plug valve, among which gate valve accounts for about 75% of the total valve. Due to the synthesis of ammonia and purification methods, the process is different and the required valve technical performance is also varied. At present, ammonia synthesis device mainly needs to use gate valve, globe valve, check valve, trap valve, butterfly valve, ball valve, diaphragm valve, regulating valve, needle valve, safety valve, and high and low-temperature valve. The construction of power station is now developing towards large scale, so large diameter and high-pressure safety valve, pressure reducing valve, globe valve, gate valve, butterfly valve, emergency cut-off valve, flow control valve and globe sealing instrument globe valve are needed. In the metallurgical industry, abrasive slurry valve (in flow stop valve) and regulating steam trap are mainly needed. The metal-sealed ball valves, butterfly valves and oxidation ball valves, globe valves and four-way reversing valves are mainly used the steel-making industry. With the development of offshore oil field exploitation, the number of valves needed for offshore development is increasing gradually. Offshore platforms shall use shutoff ball valves, check valves and multiway valves. Stainless steel ball valves, non-toxic plastic ball valves, sanitary ball valves, sanitary diaphragm valves, and sanitary butterfly valves are mainly needed in food and pharmaceutical industries. 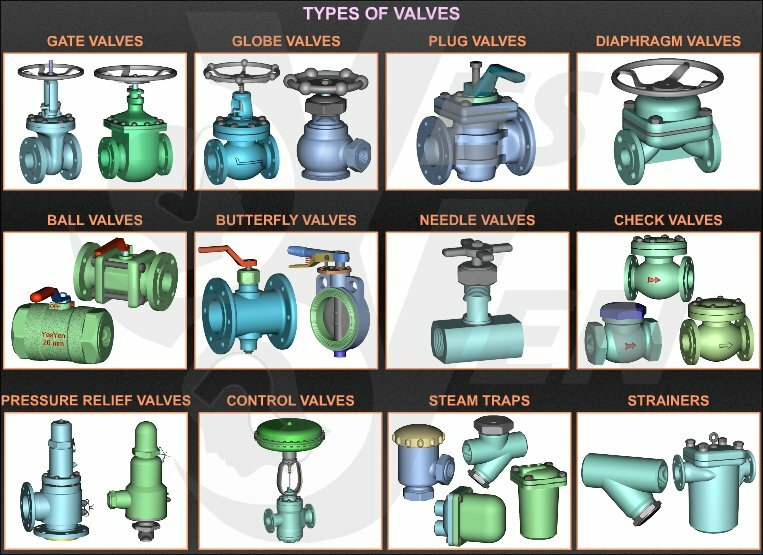 In the above 10 kinds of valve products, the demand of general valve is more than that of instrument valve, needle valve, gate valve, globe valve, check valve, ball valve, and butterfly valve.